This is a proverb with quite some history to it. Indeed its lineage has been traced to 13th Century France in: mauvés ovriers ne trovera ja bon hostill (les mauvais ouvriers ne trouveront jamais un bon outil being a rendition in more contemporary French). To me this timeless observation is applicable to present-day Business Intelligence projects. Browsing through on-line forums, it is all too typical to see discussions that start “What is the best BI software available on the market?”, “Who are the leaders in SaaS BI?” and (rather poignantly in my opinion) “Please help me to pick the best technology for a dashboard.” I feel that these are all rather missing the point. Before I explain why, I am going to offer another of my sporting analogies, which I believe is pertinent. Indeed sporting performace is an area to which the aphorism appearing in the title is frequently applied. If you would like to skip the sporting analogy and cut to the chase, please click here. Rock climbing is a sport that certainly has its share of machismo; any climbing magazine or web-site will feature images of testosterone-infused youths whose improbable physiques (often displayed to full advantage by the de rigueur absence of any torso-encumbering clothing) propel them to the top of equally improbable climbs. Given this, many commentators have noted the irony of climbing being conducted by people wearing the equivalent of rubber-covered ballet slippers. The fact that one of the most iconic rock climbing shoes of all time was a fetching shade of pink merely adds piquancy to this observation. Examples of these, the classic FiveTen Anasazi Lace-ups, are featured in the following photo of top British climber, Steve McClure (yes it is the right way up). Although it might not be apparent from the above image, these are intended to be comfortable shoes. Ones to be worn by more experienced climbers on long mountain days, or suitable for beginners, like myself at the time, on shorter climbs. Although not exactly cheap, they are not prohibitively expensive and the rubber on the soles is quite hard-wearing as well. The Zephyrs worked well for me, but inevitably over time you begin to notice the shoes worn by better climbers at the crag or at the wall. You also cannot fail to miss the much sexier shoes worn by professional climbers in films, climbing magazine articles and (no coincidence here) advertisements. These other shoes also cost more (again no coincidence) and promise better performance. When you are looking to get better at something, it is tempting to take any advantage that you can get. Also, perhaps especially when you are looking to break into a new area, there is some pressure to conform, to look like the “in-crowd”, maybe even simply to distance yourself from the beginner that you were only a few months previously. This is very shallow behaviour of course, but it is also the rock on which the advertising industry is founded. I wanted to get better as a climber, but would have to admit that other, less noble, motives also drove me to wanting to purchase new rock shoes. 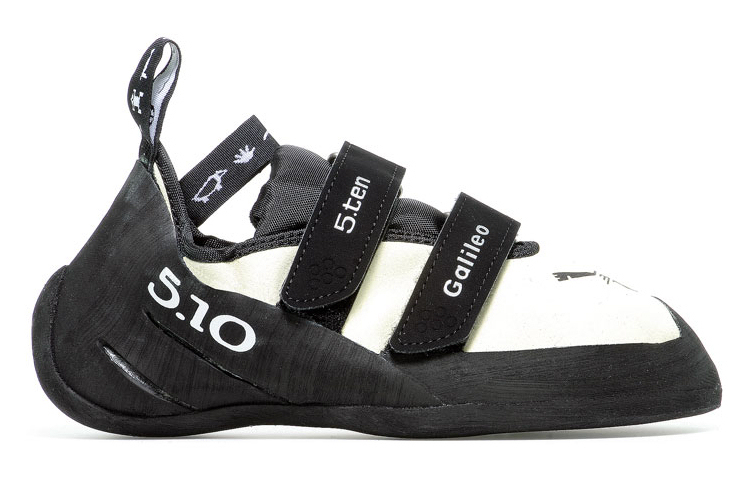 The Galileos shown above are made by US company FiveTen and are representative of the type of shoes that I have worn for most my climbing career. FiveTen shoes have been worn by many top climbers over the years (though there have recently been some quite high-profile defections to start-up brand Evolv, who can never seem to decide whether to append a final ‘e’ to their name or not). Amongst other things, FiveTens are noted for the stickiness of their rubber, which is provided by an organisation called Stealth Rubber and appears on no other rock climbing shoes. Generally the greater the adhesion between your foot and the rock, the greater the force that you can bring to bear on it to drive yourself upwards. Also it helps to have confidence that your foot has a good chance of staying in place, no matter how glassy the rock may be (and no matter how long the fall may be should this not happen). I have worn FiveTen shoes on all of my hardest climbs (none of which have actually been very hard in the grand scheme of things sad to say). Nevertheless, with what I admit was rather a sense of guilt, I have recently embarked on a dalliance with another rock shoe manufacturer, La Sportiva of Italy. The Sportiva Solutions which are shown above are both the most expensive rock shoes I have ever owned and the most technical. If NASA made a rock shoe, they would probably not be a million miles away from the Solutions. The radical nature of their design can perhaps best be appreciated in three dimensions and you can do this by clicking on the above image. My partner, who appears in the photo (incidentally sporting FiveTen shoes), climbed this on her second go. By contrast, I had many fruitless attempts wearing my own pair of FiveTens (that, to be fair to FiveTen, were much less technical than the Galileo’s above and were also probably past the end of their useful life). I frequently found my feet skittering off of the highly polished limestone, which resulted in me rapidly returning to terra firma. A couple of weeks later, equipped with my shiny new Sportivas, my feet did not slip once. Of course the perfect end to this story would have been to say that I then climbed the problem (for an explanation of why some types of climbs are called problems see my earlier article Perseverance). Sadly, though I made much more progress during my second session, I need to go back to finally tick it off of my list. So here surely is an example of the tool making a difference, or is it? My partner had climbed A Miller’s Tale quite happily without having the advantage of my new footwear. She is 5’3″ (160cm) compared to my 5’11” (180cm) and the taller you are the easier it is to reach the next hold. Strength is a factor in climbing and I am also stronger in absolute terms than she is. The reason that she succeeded where I failed is simply that she is a better climber than I am. 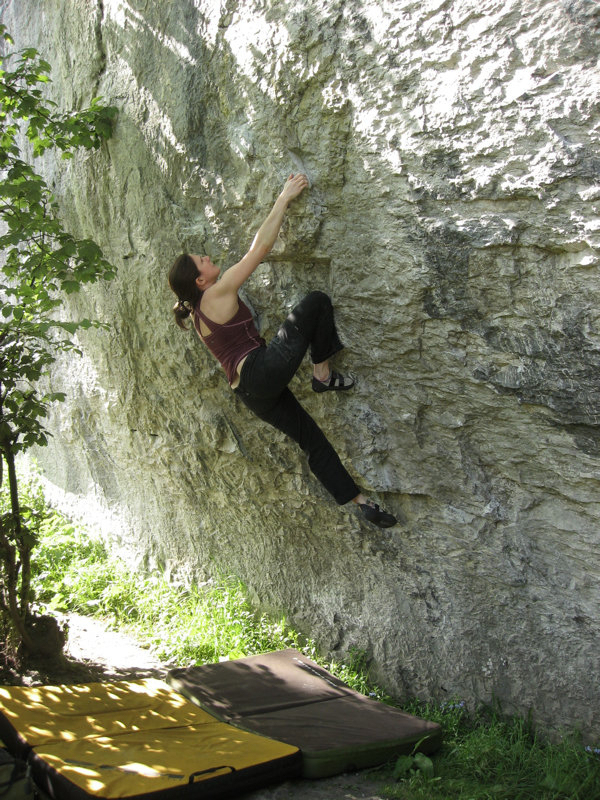 It is an oft-repeated truism in the climbing world that many females have better techniques than men. This, together with the “unfair” advantage of smaller fingers, is the excuse often offered by muscle-bound men who fail to complete a climb that a female then dances her way up. However in my partner’s case, she is also very strong, with her power-to-weight ratio being the key factor. You don’t need to lift massive weights in climbing, just your own body. So I didn’t really need better rock shoes to prevent my feet from slipping. If I got my body into a better balanced position, then this would have had the same impact. Equally, if my abdominal muscles were stronger, I could have squeezed my feet harder onto the rock, increasing their adhesion (this type of strength, known as core strength for obvious reasons, is crucial to progressing in many types of climbing). What the Solutions did was not to make me a better climber, but to make up for some of my inadequacies. In this way, by allowing me the luxury of not focussing on increasing my strength or improving my technique, you could even argue that they might be bad for my climbing in the long run. I probably protest too much in this last comment, but hopefully the reader can appreciate the point that I am trying to make. In order to become a better climber I need to do lots of things. I need to strengthen the tendons in my fingers (or at least in nine of them as I ruptured the tendon in my right ring finger playing rugby years ago) so that I can hold on to smaller edges and grasp larger ones for longer. I need to develop my abdominal muscles to hold me onto the rock face better and put more pressure on my feet; particularly when the climb is overhanging. I need to build up muscles in my back, shoulders and arms to be able to move more assuredly between holds that are widely spaced. I must work on my endurance, so that I do not fail climbs because I am worn out by a long series of lower moves. Finally I need to improve my technique: making my footwork more precise; paying more attention to the shape of my body and how this affects my centre of gravity and the purchase I have on holds; getting more comfortable with the tricks of the trade such as heel- and toe-hooks; learning when to be aggressive in my climbing and when to be slow and deliberate; and finally better visualising how my body fits against the rock and the best way to flow economically from one position to the next. If I can get better in all of these areas, then maybe I will have earned my new technical rock shoes and I will be able to take advantage of the benefits that they offer. Having the right shoes can undoubtedly improve your climbing, but it is no substitute for focussing on the long list in the previous paragraph. There is no real short-cut to becoming a better climber, it just takes an awful lot of work. A final thing to add in this section is that the Solutions offer advantages to the climber on certain types of climbs. On any overhanging, pocketed rock, they are brilliant. But the way that they shape your foot into a down-turned claw would be a positive disadvantage when trying to pad up a slab. In this second scenario, something like my worn out FiveTens (now sadly consigned to the rubbish tip) would be the tool of choice. It is important to realise that the right tool is often dictated by the task in hand and one that excels in area A may be an also-ran in area B. Lest it be thought that the above manufacturers play only in narrow niches, I should explain that each of Boreal, FiveTen and La Sportiva produce a wide range of rock shoes catering to virtuially every type of climber from the neophyte to the world’s best. If you think that the pound dollar rates are rather strange in the above exhibits, then a few things are at play. Some are genuine differences, but others are because they are historical rates. 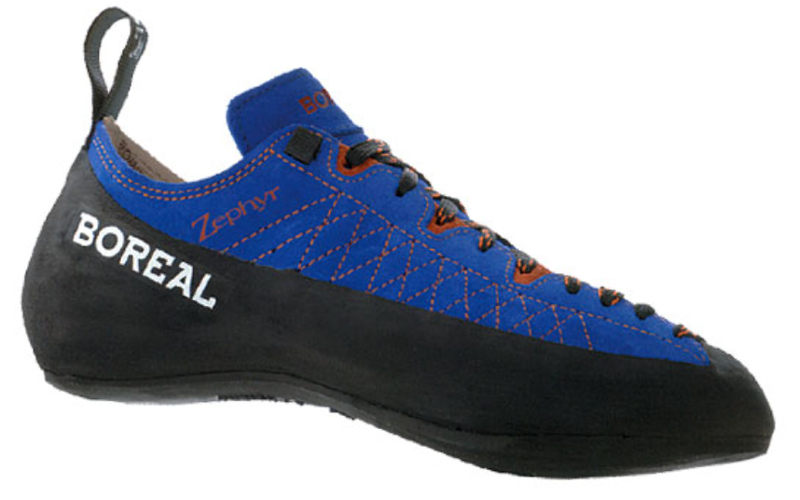 for example, I struggled to find a US web-site that still sells Boreal Zephyrs. If you are interested in finding out more about my adventures in rock climbing, then take a look at my partner’s blog. I hope that I have established that at least in the world of rock climbing, the technology that you have at your disposal is only one of many factors necessary for success; indeed it is some way from being the most important factor. Having really poor, or worn out, rock shoes can dent your confidence and even get you into bad habits (such as not using your feet enough). Having really good rock shoes can bring some incremental benefits, but these are not as great as those to be gained by training and experience. Most of the technologically-related benefits will be realised by having reasonably good and reasonably new shoes. While the level of a professional rock climber’s performance will be undoubtedly be improved by using the best equipment available, a bad climber with $150 rock shoes will still be a bad climber (note this is not intended to be a self-referential comment). Returning to another of my passions, Business Intelligence, I see some pertinent parallels. In a series of previous articles (including BI implementations are like icebergs, “All that glisters is not gold” – some thoughts on dashboards and Short-term “Trouble for Big Business Intelligence Vendors” may lead to longer-term advantage) , I have laid out my framework for BI success and explained why I feel that technology is not the most important part of a BI programme. Determine what information is necessary to drive key business decisions. Understand the various data sources that are available and how they relate to each other. Transform the data to meet the information needs. Manage the embedding of BI in the corporate culture. Obviously good BI technology has a role to play across all of these areas, but it is not the primary concern in any of them. Let us consider what is often one of the most difficult areas to get right, embedding BI in an organisation’s DNA. What is the role of the BI tool here? If your systems do not have credibility with your users, then all is already lost and no amount of flashy functionality will save you. Similar points can be made about all of the other pillars. Great BI technology should be the icing on your BI cake, not one of the main ingredients. The really important question in BI is not which tool is best, but how to make BI projects successful. While many an unsuccessful BI manager may blame the tool or its vendor, this is not where the real issues lie. 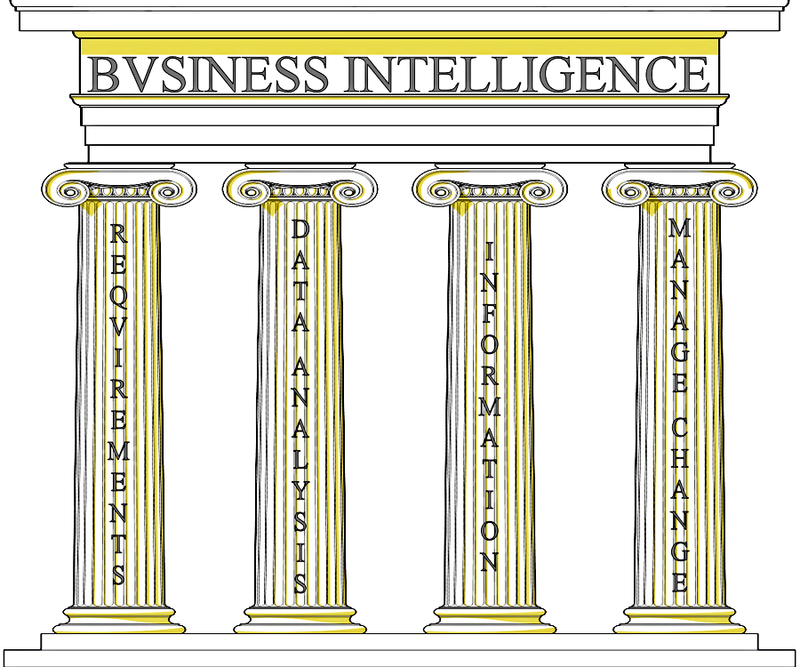 I firmly believe that successful BI rests on four mutually reinforcing pillars: understand the questions the business needs to answer, understand the data available, transform the data to meet the business needs and embed the use of BI in the organisation’s culture. If you get these things right then you can be successful with almost any of the excellent BI tools available in the marketplace. If you get any one of them wrong, then using the paragon of BI tools is not going to offer you salvation. I think about BI tools in the same way as I do the car market. Not so many years ago there were major differences between manufacturers. The Japanese offered ultimate reliability, but maybe didn’t often engage the spirit. The Germans prided themselves on engineering excellence, slanted either in the direction of performance or luxury, but were not quite as dependable as the Japanese. The Italians offered out-and-out romance and theatre, with mechanical integrity an afterthought. The French seemed to think that bizarrely shaped cars with wheels as thin as dinner plates were the way forward, but at least they were distinctive. The Swedes majored on a mixture of safety and aerospace cachet, but sometimes struggled to shift their image of being boring. The Americans were still in the middle of their love affair with the large and the rugged, at the expense of convenience and value-for-money. Stereotypically, my fellow-countrymen majored on agricultural charm, or wooden-panelled nostalgia, but struggled with the demands of electronics. Nowadays, the quality and reliability of cars are much closer to each other. Most manufacturers have products with similar features and performance and economy ratings. If we take financial issues to one side, differences are more likely to related to design, or how people perceive a brand. Today the quality of a Ford is not far behind that of a Toyota. The styling of a Honda can be as dramatic as an Alfa Romeo. Lexus and Audi are playing in areas previously the preserve of BMW and Mercedes and so on. To me this is also where the market for BI tools is at present. It is relatively mature and the differences between product sets are less than before. Of course this doesn’t mean that the BI field will not be shaken up by some new technology or approach (in-memory BI or SaaS come to mind). This would be the equivalent of the impact that the first hybrid cars had on the auto market. However, from the point of view of implementations, most BI tools will do at least an adequate job and picking one should not be your primary concern in a BI project. If you are interested, you can read the full interview here. As my comments to Ajay suggest, maybe in past times there were greater differences between BI vendors and the tools that they supplied. One benefit of the massive consolidation that has occurred in recent years is that the five biggest players: IBM/Cognos, Oracle/Hyperion, SAP/BusinessObjects, Microsoft and (the as yet still independent) SAS all have product portfolios that are both wide and deep. If there is something that you want your BI tool to do, it is likely that any of these organisations can provide you with the software; assuming that your wallet allows it. Both the functionality and scope of offerings from smaller vendors operating in the BI arena have also increased greatly in recent times. Finding a technology that fits your specific needs for functionality, ease-of-use, scalability and reliability should not be a problem. As an aside, should both Microsoft and SAS be worried that they are omitted from this list? Whatever the corporate logic for IBM, to me this is simply more evidence that BI technology is becoming a utility (it should however be noted that this is not the same as BI itself becoming a utility). I believe that this trend will lead to a greater focus on the use of BI technology as part of broad-based BI programmes that drive business value. Though BI has the potential of releasing massive benefits for organisations, the track record has been somewhat patchy. Hopefully as people start to worry less about BI technology and more about the factors that really drive success in BI programmes, this will begin to change. As with any technical innovation over the centuries, it is only when the technology itself becomes invisible that the real benefits flow. Incredibly impressive blog post – seguing from rock climbing to BI. So I don’t mean to be critical, but… The Reuters article mentions MicroStrategy as a major BI player, while your blog post does not. If you haven’t yet, do take a look at MicroStrategy’s technology. There is a 30-day Eval version of the platform for pure trial purposes – but also a new reporting package – MicroStrategy Reporting Suite – which is free for up to 100 users, with a 1 CPU limit. For more info on what’s included: http://www.microstrategy.com/freereportingsoftware. My apologies for omitting Microstrategy (which was the first BI tool I ever saw working live) from the list. Thanks, Peter; really appreciate your history in the space. Excellent (somewhat lengthy) blog / article, but I persevered through to the end. Can’t relate to the rock climbing but it (good tool, bad craftsman scenario) certainly applies in my musical world. Thanks for that insight Peter. A bad workman blames his tools! There is no syllable that cannot be used in mantras. There is no root that cannot be used in medicine. There is no person who is useless. But, the users capable of making effective use of these are rare. I agree, for the most part, with your post (except about cricket and rock climbing, which I do not know anything about…) but there’s a point that I’d be pleased to see discussed in a deeper detail. What is someone supposed to do if the customer thinks that requirements are obvious (i.e they are genetically unable to analyze their way of working) and the tools are the key to success? I faced this issue many times, and I always had serious issues before changing the customer’s mind. Nice perspective on “it’s not the tool.” Tech is always such a shiny object and marketing always promises the silver bullet. BI is so much more and requires a significant amount of thought around process and insight before considering a solutions. @Stray Cat – I think the challenge is walking them through their process providing the right questions that tease out their steps and thought process. It can be done/started when they provide their reporting and say, “we want this.” Then, use that as the catalyst to build out what you need. Think mars vs venus. Considering that I’m in the middle of redirecting a BI implementation gone awry, this was timely. Always great thoughts. Thanks Peter! Thanks for the comments Michele – have been too busy to blog or tweet at all recently. Will have to remedy this soon. No. It is the tool. Sorry, but I have to disagree with you all. If it is SO difficult to get a successful project, then we have to ask ourselves some difficult questions. The technical barrier is preventing success both for users and implementers. Or is everyone wrong. In fact I never remember anyone saying “wow” after an implementation – esp six months later. why? I can remember users saying “wow” post-project. There is a selection of comments about just one BI/DW project available here. If you are blaming tools for failed projects, when other have been successful with the very same tools, then I think you are making the same point as me. Tell that to Neil Gresham. Only poor climbers beveile you can achieve as much with brute force as you can with good technique. The best climbers understand that you need both, but ultimately until your footwork is right there’s no point to over-average arm strength. Um… giving you the benefit of the doubt re spam (as the comment is at least tangentially related to the article); however not 100% sure that you read the article itself. WRT Neil, I’m mention this to him next time I bump into him.